Albert C. DiFonzo, 88, of 154 Henderson Road, Lewis Run, passed away, Monday September 24, 2018. at the Pavilion @BRMC, surrounded by his loving family. Born January 5, 1930, in Lewis Run, he was a son of the late John D. and Henrietta (Pingie) DiFonzo. On August 15, 1959 in Our Mother of Perpetual Help Church in Lewis Run, he married Janet L. (Henderson) DiFonzo, who died April 15, 2013. He was a 1948 graduate of Bradford High School where he participated in football and track. On August 19, 1948, he enlisted in the United States Air Force, served during the Korean War, and was honorably discharged on July 18, 1952. He then attended the University of Miami,Fla., graduating with a degree in physical education in 1958. He then embarked on a 34-year career in public education for the St. Marys, Sayre Area and Corry Area School districts. 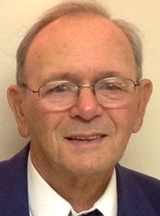 He was head football coach at Sayre from 1962-68, twice leading teams to undefeated seasons. He was especially proud of his 1967 team, which was selected best ever of all high school teams covered by the Sayre Evening Times. His bonds with players lasted well after he moved his family to Corry following the earning of his guidance counselor certificate from St. Bonaventure University in 1968. He was voted onto the Sayre football coaches Wall of Honor in 2011 and the Sayre Class of 1968 honored him at their 45th class reunion in 2013. Mr. DiFonzo retired from Corry as guidance department chair in 1992 until he and his wife relocated to the Lewis Run area the following year to be near family in their retirement years. In addition to football, Mr. DiFonzo enjoyed golf and bowling, winning awards in both sports. Early in his retirment, he was a starter at Pine Acres Country Club where he and his wife participaited in couples leagues. He also belonged to a mens golf group that traveled weekly to courses all over the region. He especially enjoyed the different restuarants they'd visit for lunches and league dinners and cherished the friends he'd made over the years. He was a member of Corry Elks Lodge, Bradford American Legion, VFW, and F.O.Eagles. Surviving are three children, John DiFonzo of Lewis Run, Brian (Tina) DiFonzo of Titusville, and Bud DiFonzo of Lewis Run; two grandchildren, Jennifer (Michael) Douglas of Duke Center, Angela DiFonzo of Kane; two great grandchildren, Michael Douglas and Kendra Douglas of Duke Center and several nieces and nephews. He was preceded in death by his parents, wife, an infant daughter, two sisters Rose and Helen DiFonzo, four brothers: Paul "Trix" DiFonzo, Joseph DiFonzo, John DiFonzo, and Frank DiFonzo. Memorials, if desired, may be made to the charity of the donor's choice. May the Lord be with you John and your family and give you peace! God bless ! Rest In Peace ! Brian, Tina and the DiFonzo family: Coach DiFonzo was a good man. He will be missed. You will be in our thoughts & prayers this weekend. I just heard of Al''s passing from another ex Corry teacher. So many good memories over the years. You will all be in our thoughts and prayers. Brian and family, So sorry to read of your loss. I know now where you get your knowledge and interest in sports, Brian. You are a younger image of him. I''m sure he was a wonderful dad. My sympathy. Rest in peace Coach. You will always be in my thoughts. Cousins...Our sympathies are with you at the loss of your dad. Unfortunately, we are traveling in another part of the country this week and will not be able to attend your services. I am at a loss for words. Uncle Al will he missed. Rest In Peace coach, we love you. Rest in Peace Al. Now you can continue to correct my fathers golf game in Heaven. Deepest sympathy to the family of Coach Al. He was a good man and he enjoyed a long healthy life. Many students are proud to have known him. Rest in Peace Coach.